A 30 minute total body workout that strengthens, lengthens, and stretches your entire body to create a long and lean physique. Based on dance/Pilates formats. All levels. This high intensity workout is sure to leave no muscle untouched! This one hour class gets your heartrate up with movements of cardiovascular training, strength training, core work and stretching. All types of equipment is utilized for a variety of exercises. This class will improve muscle tone, endurance, and overall strength. 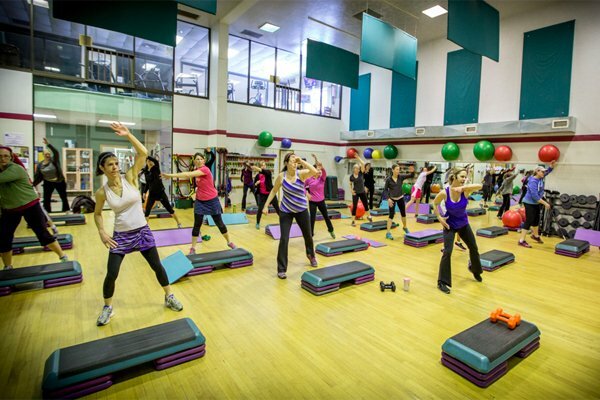 A 45 minute step aerobics class that may include a variety of cardio exercises including floor aerobics or sports conditioning with 15 minutes of strength training at the end. All Levels. An interval class that mixes step, floor aerobics and strength training exercises for the core total body in one incredible workout! In this class we will practice modified seated and standing yoga postures using the support of the chair. You will leave feeling relaxed and rejuvenated without having to get down on the floor. A great way to introduce creative exercise and fun aerobic movements. Try this low impact workout. Perfect for seniors. Brenda will have you singing in no time. 60 min. Class consists of 30 minutes of step cardio and then 30 minutes of weight, core, abdominal work, and stretching. All levels! Fun cardio mixed with sculpting using weights, your own body weight, or any of the many tools available. All levels. A one hour mix of interval exercises combined with core work and strengthening in variations to provide a complete body workout! A 30 minute mat class fashioned after Joseph Pilates’ dynamic exercises. This series of core exercises will add strength to enhance all sports and daily living activities. A 30 minute full body cardio jam session, combining light resistance with constant simulated drumming. Uses cardio, Pilates, strength movements. A 45 minute class designed to burn calories, define muscle, and improve endurance in this challenging workout session. Class consists of 45 minutes of step aerobics with intervals of weight work, and one-minute anaerobic workouts, followed by 15 minutes of core strengthening/ab work/ stretching. All Levels! An invigorating workout using intervals of step and muscle sculpting for 2 great workouts in one! Burn fat and increase your metabolism. (45 minutes, All levels). Sculpt, strengthen tone and define your entire body. highly recommended to those enrolled in a weight loss program because it helps to retain lean muscle tissue while boosting metabolism. All levels. A fusion of Latin and International music and dance themes that create a dynamic, exciting, and effective fitness workout. A guaranteed fun time! Designed for everyone, every shape, age and gender. Also features Core Training to target moves to strengthen and tone your core. A 45 minute groove session cycling to an awesome playlist that makes time fly by. Come join this high calorie-burning workout. All levels welcome. This six or eight week session incorporates weight room training and multi-training interval for the intense exerciser or modifications to accommodate any fitness level. LUNCH CRUNCH! 4 Weeks, 9 Classes! This class is a one hour long, easy to follow strength training with Cardio HIT (High Intensity Training). Total Body Workout. All levels welcome. Extra fee class which normally runs in 6-8 week sessions. Instructed by Jameson, PN ProCoach Workouts is a semi-private individualized training program exclusively available to Precision Nutrition coaching clients. Must be in program to take this class. 6 Weeks – 12 sessions. These sessions allow you to work closely with a trainer on a program more specific to each individual.